For maximum coding accuracy, rely on the CDT 2019 Dental Coding Kit. Includes both the new CDT coding book and the CDT Companion at a savings of $20 off individual prices. Save money and time with this coding combo! For maximum coding accuracy, rely on the CDT 2019 Kit. 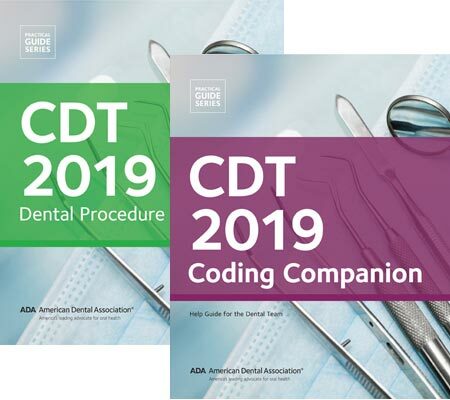 Includes both the new CDT coding book and the CDT 2019 Companion: Help Guide for the Dental Team at a savings over $25 off individual prices. CDT 2019 is the official source for the most accurate and up-to-date dental procedure codes. Newly revised and reorganized to make finding information easier, the CDT 2019 Coding Companion is a dynamic training tool. It includes a coding Q & A and real-life scenarios to increase staff comprehension – and reduce rejected claims. Use them together to create an unstoppable coding team. Provides updated CDT 2019 codes, as developed by the ADA, the official source for CDT codes and the only HIPAA- recognized code set for dentistry. Medical to dental cross coding feature allows you to connect ICD10 codes to CDT dental codes. Make sure that everyone in the dental office knows how to code properly and complete insurance claims.